Designed as light bomber and reconnaissance aircraft, Dauntless SBD (Scout Bomber Douglas) monoplanes served during WWII with US Marine Corps, Army and Navy air squadrons. The Dauntless originated with the design of the Northrop BT-1 of which the Northrop Corporation was a subsidiary of The Douglas Aircraft Corporation. Northrop was dissolved on September 8, 1937 and Northrop designs continued production under Douglas.1 The aircraft was a low-wing cantilever configuration of all-metal construction, except for fabric covered flight controls. It had a two-man tandem cockpit with dual flight controls and hydraulically actuated perforated split dive-brakes. On November 28, 1937 numerous major modifications were ordered of the BT-1, one of which was the landing gear being changed from retracting backwards into large fairing trousers beneath the wings, to folding laterally into recessed wheel wells.2 The new model, the XBT-2, became the forerunner of the now well known Dauntless. When the aircraft was delivered to Anacosta for flight testing with a larger 1,000 hp Wright R-1920-G133 engine, the performance was greater than expected with a top speed of 265 mph (429 km/h). The aircraft was then delivered to Langley Memorial Aeronautical Institute for wind tunnel tests and numerous design changes were made. Modifications were made to the flight controls, leading edge slots and a dorsal fin were added. The perforated flaps developed on the BT-1 were retained to eliminate tail buffeting during diving maneuvers. The initial order was for 36 aircraft, but was increased to 144 which included both SBD-1s and SBD-2s. Modifications included a center auxiliary fuel tank for a total capacity of 210 gallons. The production engine was a 1,000 hp Wright R-1820-32. Armament consisted of two forward firing 0.50 caliber in machine guns in the engine nose cowling and one flexible rearward firing, drum-fed 0.30 caliber machine gun. A swinging bomb cradle carried a 1,000 lb bomb below the fuselage and a 100 lb bomb was mounted under each wing. The bomb cradle was designed so that the bomb would swing clear of the prop during dive-bombing maneuvers. The Douglas Dauntless was a direct development of the Northrop BT-1. Early on, severe tail buffeting was encountered, which was eliminated by perforated flaps. Also shown are the trouser fairings that housed the landing gear when retracted. The SBD-2 fuel capacity was increased to 310 gallons with the elimination of the center auxiliary tank and replaced with 65 gallon tanks in the outer wing panels. SDB-2s were later retrofitted with self sealing tanks, which reduced total fuel capacity to 260 gallons. Armament was reduced by the removal of one forward firing 0.50 machine gun in the engine nose cowling. The Douglas Dauntless retained the perforated flaps developed on the Northrop BT-1, but the landing gear retracted laterally into recessed wheel wells. Also visible in this photo are the leading edge wing slots. The SBD-5 (A-24B-DT) was the main production model built with a larger 1,200 hp Wright R-1820-60 engine. The engine air intake was removed from the upper cowling which was the main distinguishing mark of all earlier models. The bomb load was increased to 2,250 lb with a 1,600 lb bomb under the fuselage and a 325 lb bomb under each wing. The twin rearward-firing guns were no longer add-ons and were factory installed. The SBD-6 was fitted with a 1,350 hp Wright R-1820-66 engine and was equipped with ASV (Air to Surface Vessel) radar. The all-metal fuel tanks were replaced by self-sealing bladder fuel tanks with a total capacity of 284 gallons. 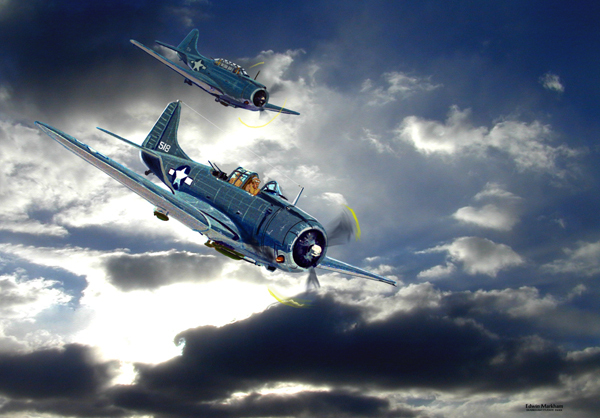 The first squadrons to receive the Dauntless were USMC VMB-2 in late 1940 and VMB-1 in early 1941. The first Navy squadrons were equipped with SBD-2s and at the end of 1941 were assigned to VB-6 on the USS Enterprise squadron and VB-2 on the USS Lexington.5 Other Navy squadrons equipped with the SBD Dauntless were VB-3, VB-5, VS-2, VS-3, VS-5 and VS-6. Other USMC squadrons were equipped with the plane as well.6 Nine examples were sent to the Royal Navy Fleet Air Arm and were designated the Mk.I but were not used operationally. A small quantity were supplied to Mexico. A Dauntless SBD warms up on the Yorktown during the battle of Midway. Shown is the engine air intake on the upper cowling which was the main distinguishing mark of all earlier models. At the time of the attack of Pearl Harbor, the Dauntless was the standard dive bomber7 and was the first US Navy plane to sink an enemy ship (Japanese sub I-70) in WWII, just three days after Pearl Harbor.8 The first real test came on May 7,1942, when US aircraft carriers, USS Lexington and USS Yorktown, faced three Japanese carriers in the Battle of the Coral Sea. The two-day battle was the first naval battle in which victory was decided by aircraft alone. Dauntless dive-bombers fought well alongside other US aircraft and were credited with forty of the ninety-one enemy aircraft downed.9 During the battle, the US lost the carrier USS Lexington and the Japanese lost the light carrier Shoho, which was sunk by Dauntless and Devastator bombers.10 The Shokaku received serious bomb damage and Zuikaku's air group was badly depleted, eliminating these carriers from the upcoming Midway operation. While the battle was a technical victory for Japan, the US had prevented Japanese ships from supporting an invasion of Port Moresby, New Guinea, and a proposed air assault on Australia. In the great Battle of Midway in June US naval aircraft, spearheaded by Dauntless dive-bombers, sank the Japanese carriers, Akagi, Kaga, and Soryu. Only the Hiryu remained operational which would launch a retaliatory strike against the USS Yorktown later in the day. However, before the day ended, US carrier planes found and bombed Hiryu, putting her out of action. A Japanese cruiser and 250 aircraft were also destroyed, for the loss of only one US carrier, a destroyer and 150 aircraft. The Battle of Midway turned the tide of war against the Japanese in the Pacific. As the war went on, the Dauntless equipped no less than twenty Marine squadrons and were retained until late 1944. It was the main type US navy dive-bomber and was not only used in the Pacific, but during the Allied landing in North Africa and in the Battle of the Atlantic. The Dauntless had the lowest attrition rate of any US carrier aircraft, because of its ability to absorb battle damage. Dauntless aircraft accounted for many Japanese aircraft shot down in air-to-air combat, and finished their wartime career as antisubmarine bombers and as attack aircraft, carrying depth charges and rocket projectiles respectively. The total production of the Dauntless was 5,938 aircraft built. The first SBD-1 was completed in April 1940 and flown on May 1, 1940 with production continuing until to the end of 1944. In the summer of 1941, 168 SBD-3s were delivered to the USAAF and were designated as the A-24 Banshee. The Army had been looking for an airplane to compete with the Junkers Ju-87 dive bomber, but operated no similar aircraft of this type. The A-24 faired rather badly in combat and the USAAF was not as successful with the Dauntless as was the Navy. On 29 Jul 1942, seven A-24s were sent on a bombing mission to Buna, without top cover, and were intercepted by A6M Zeros—only one survived.11 The A-24 was subsequently withdrawn from first-line service. In spite of the apparent lack of success with the A-24, the USAAF continued procurement with 170, A-24As (SBD-4) and 615, A-24Bs (SBD-5). First-line capacity also tailed off for the US Navy and USMC by late 1944, and the Douglas Dauntless was superseded by the Curtiss SBC2 Helldiver. (895 kw), Radial 9 cylinder, Air-cooled. One 1,000 lb fuselage bomb. Two 100 lb wing bombs. One forward-firing 0.50 mg.
Two 100 lb wing bombs. Two forward-firing 0.50 mg.
One 1,600 lb fuselage bomb. Two 325 lb wing bombs. 1. Rene J. Francillon. McDonnell Douglas Since 1920, Volume I. Annapolis, Maryland: Naval Institute Press, 1990. 23. 4. Kenneth Munson. Bombers 1939-45, Patrol and Transport Aircraft.London: Blanford Press, 1969. 105. 5. Rene J. Francillon. 260. 6. David Mondey. The Concise Guide to American Aircraft of World War II. New York: Smithmark Publishers, 1996. 124. 7. Howard Mingos, ed. The Aircraft Year Book for 1943. New York: Aeronautical Chamber of Commerce of America, Inc., 1943. 240. 8. Bill Yenne. McDonnell Douglas, A Tale of Two Giants. New York: Crescent Books, 1985. 45. 11. Rob Stern and Don Greer. SBD Dauntless in Action. Carrollton, Texas: Squadron Signal Publications, 1984. 17. Douglas J. Ingells. The McDonnell Douglas Story. Fallbrook, Ca: Aero Publishers, Inc., 1979. 62. Robert D. Loomis. Great American Fighter Pilots of World War II. New York: Random House, 1961. 29-42. © Larry Dwyer The Aviation History On-Line Museum. All rights reserved. Created June 15, 2001. Updated December 29, 2013.